Consumers today are becoming increasingly accustomed to companies asking for feedback. Whether you just paid for coffee and were asked about your experience or you received an email from your credit card company asking for feedback, survey solicitation is becoming a weekly, or even daily, occurrence. With so many businesses striving to tailor their customer experience, feedback is critical to move the needle. In the hospitality industry, guest feedback is absolutely pivotal in creating a positive experience. Proper response to feedback can also turn a negative experience around to ensure repeat business. But, since customers receive surveys on a regular basis from many different companies, hotels need to set themselves apart to ensure the highest possible completion rate. How do hotels stand out in an environment where every company competes for their guests’ attention? Surveys 101 is here to assist in ensuring your surveys are delivered, opened, clicked, and responded to. Take a quick second to reflect on a poor survey taking experience that you have encountered. Most likely that survey was long, had too many questions, a status bar that never seemed to complete, and was overall not an easy experience. Too often survey providers ask their users for too much of their time to solicit feedback on every aspect of their experience. To elaborate, ideally, the survey should ask specific questions that are easy to answer. The questions should also be designed to give you, the hotelier, results that provide data you can use to improve your operations. The length of the survey is always debatable but look at it with this lens: it is better to ask 10 questions and receive 100 responses than ask 100 questions and receive 10 responses. Another major focal point revolves around loaded and biased questions. Too many times surveys will contain a question that is phrased, “How was your flawless check-in experience?” This is against the rules of surveys! A biased question will not give you accurate data, and may turn your guest off to completing the rest of the survey. Additionally, loaded questions need to be avoided. The most common loaded questions contain items that are not exclusively related to each other. A question like, “Was the staff helpful and friendly?” is an example, as the staff member may have been helpful but had a poor attitude or been friendly but not very helpful. In some instances the staff member may be both or neither. The same goes for a question like “Please Rate your Check-in and Check-out Experience.” One of these experiences may have been great and the other poor; this question groups questions that should be separated for the most actionable data results. Many times the missing ingredient in a survey is a problem resolution question. If someone encountered a problem during their stay, it is imperative to (1) ask where the problem occurred, (2) ask for a details of the event, (3) ask if the problem was resolved to the customers satisfaction, and (4) find out if it impacted the overall stay. This is an opportunity to let your guest “sound off” about their stay; take the constructive feedback and improve the guest experience for the next group of arrivals. While it is important to ensure your survey will be completed, what good is it if the guest doesn’t open the invitation email? There is plenty of debate around when and how often to ask for feedback via survey solicitation. Invitation, Reminder & Thank You Emails should be used strategically to ensure the best results. Email deliverability is critical to ensuring high completion rates on your surveys (CLICK HERE to read more about that). Completion rates should hover around 10% but those numbers can be higher or lower depending on a number of items; Revinate completion percentages are around 14-18%. Reminder Emails can be a sensitive subject as some may see them as bombarding your guests. But, they can be very successful depending on the hotel’s audience and goal of the survey. If the goal is to increase completion percentage (as most are) sending a friendly reminder is very important and, usually, results in a higher completion percentage. One best practice is to send the Reminder Email 5-6 days after the invitation email. 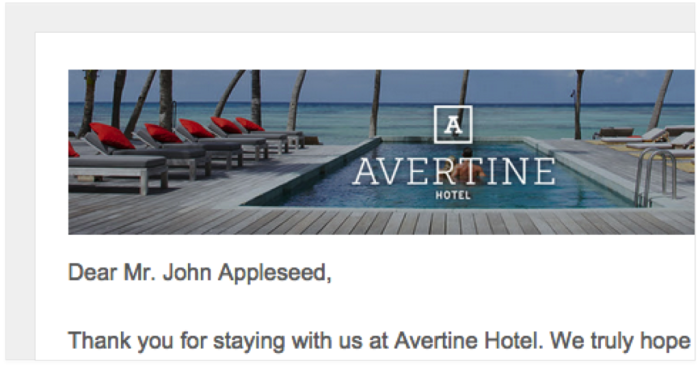 You can send an automated email to thank guests for completing a survey, but this type of email should only be sent to guests who have a positive experience. This can be a great way to give your promoters another channel to tell people about their great experiences. If a guest has a poor experience, they are not looking for a generic auto-reply asking them to reach out to the general manager if they would like to speak further. They are also not looking for an email offering a generic apology. While surveys have been traditionally a straightforward internal feedback opportunity, companies like TripAdvisor have partnered with hospitality surveys companies to allow surveys to be easily submitted for publication. TripAdvisor publishing allows hoteliers to send a simple two-page survey via Revinate that consists of internal questions then a widget to complete a TripAdvisor review (all without being a member to the site). This is a unique and fun feature that increases public visibility with no extra effort. It is critical to close the loop on guest feedback and ensure your hotel guests are given the opportunity to talk about their stays. In today’s instant feedback society, sometimes first hear about an issue when a guest writes about it on Booking.com, Yelp or TripAdvisor. 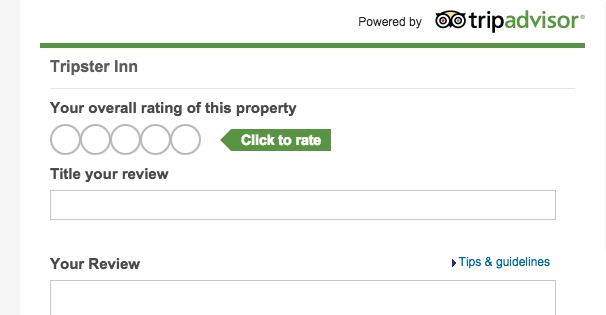 Receiving additional internal feedback, analyzing your feedback for trends in the data, and increasing your volume of public feedback by submitting your feedback to be published on TripAdvisor, is critical to continued improvement, and to differentiate your hotel from the hotel across the street.